Travel-NEPAL.com, The Ultimate Site On NEPAL - Rafting. Rivers here are graded from class 1 to 6 with class 1 as an easy-moving water with few obstacles, and class 6 being considered nearly impossible to negotiate and a hazard to life. Anyone who is in reasonable physical shape and not afraid of water can safely go rafting on rivers with grading from 1 to 3. From 4 to 6, people should be active, confident and preferably have some rafting experience. The best time for rafting are September to early December, and March to early June. September to October and May to June can be extremely high monsoon run-off. 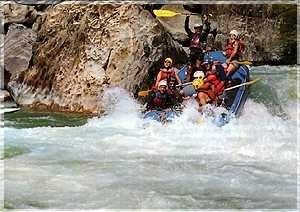 At this time only experienced rafting company with an intimate knowledge of the river operates the excursion. From the mid -October onwards the weather is settled and this is one of the most popular times to raft. In December many rivers become too cold to enjoy, a time to consider a shorter trips. From June to August the monsoon rains arrive and the river flows becomes 10 times the low-water flows. There are many different type of river rafting. Nepal will be the first white-water experience for many people. It is very important to select the type of trips that suits your interest and ability. Before planning on any of your trips, make sure that you go and visit your rafting company and get all the necessary information on it. Any raft with an oar frame the guide normally sits in the middle and rows, while the other passengers enjoy the scenery. With a paddle raft the guide normally sits at the back calling instructions and steering, while the crew provides the power. 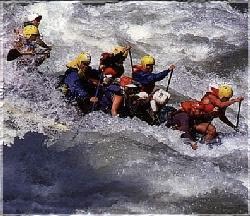 A good team work is very important while rafting. Rafting trips are generally quite luxurious trips where you rowed down the river and staff do everything for you (pitch camp, cook and so on). The quality of rafting equipment is another variable, and can make a huge difference to the safety of participants. There should be a minimum of two rafts per trip. If anybody does fall out of a raft, the second one can help with the rescue. In high water three raft is safer than two and also many rafters prefer one or two professional kayak's to run the most difficult rapids on the river. Always remember to check how many people have booked and paid for a trip, and the maximum number that will be taken. If you are the only person booked, you are not going to have enough people to run a safe trip. If you are going for an organized rafting trip, all the necessary permits and equipment will be arranged by your rafting company. You only need a light cotton clothing. You may also need to bring sun hat, swim-suit, sun screen and light shoes or sandals. For overnight trips a sleeping bag is necessary and can easily be hired. There are about 80 to 90 companies in Kathmandu claiming to be rafting operators. Most of them are only good for a days raft (mostly formed by a group of guides breaking away), however there are also some well established and reputed companies as well. Trips range in price from $ 15 to $ 70 a day, and generally you get what you pay for. At $ 15 you don't get much, it's better to pay a it more and have a good and safe trip rather than to save $ 100 and have a lousy, dangerous trip. Rafting Chapter courtesy of Ultimate Descents.